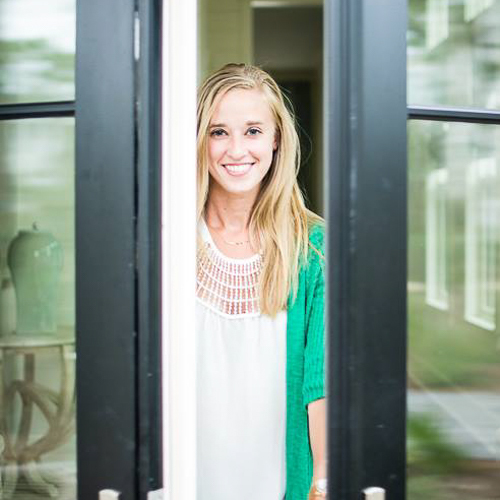 I thought I’d dedicate this week’s posts to all things Easter and Easter brunch. It’s been a while since I had a themed week. As many of you are already aware, I’m basically obsessed with breakfast and breakfast foods. Any chance I get to dedicate a week to it, get’s me insanely excited. So, yippee! I’ve been going kind of crazy this past week and weekend preparing frittatas, glazed ham, strawberry beermosas, white chocolate raspberry pots de creme, and savory crepes with the easiest cheesy hollandaise ever. Oh, and did I mention ham and brie turnovers?! I’m salivating just thinking about it. First on the list: this spring asparagus and mushroom frittata. The thing I love most about Easter brunch is how it combines recipes from winter and spring AND breakfast and lunch/dinner. I mean you can literally serve anything at an Easter brunch and your guests are going to love it. It’s also a great way to throw together a bunch of recipes that normally you wouldn’t pair together. I love that you can be so creative without it being difficult or time consuming (like Thanksgiving tends to be). I love making frittatas. Zach and I can usually polish one off easily by ourselves. It’s a blank canvas to create the perfect breakfast or brinner recipe. I think this can be said for really any type of eggs. I love coming up with new and improved ways to liven them up. This spring asparagus and mushroom frittata in particular is one of my favorites and contains some of my favorite ingredients. The baby asparagus was looking especially adorable at the grocery store, so I knew I had to throw it into the mix. 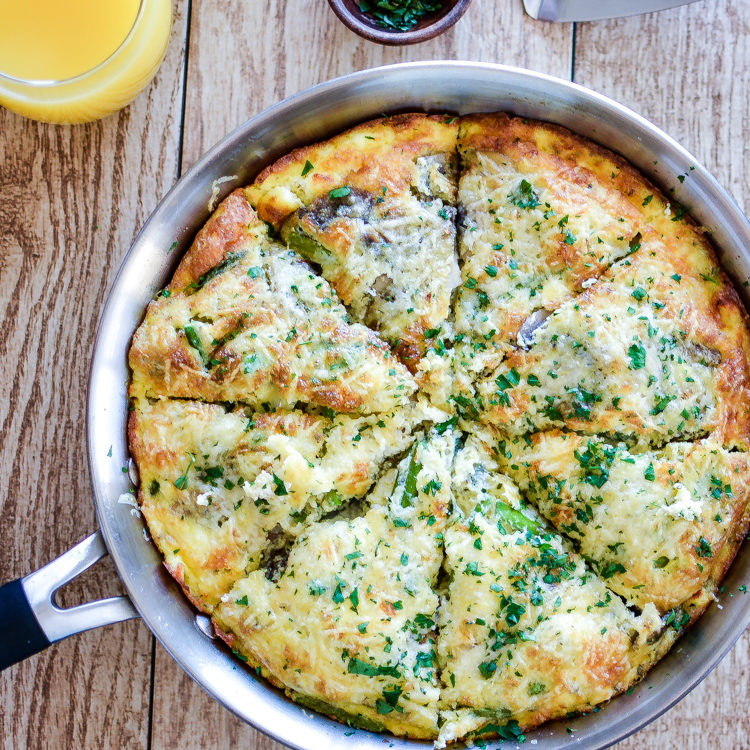 Add mushrooms and shallot and a ton of herbs, and I swear this frittata tastes like spring! In a medium to large-sized skillet, heat the olive oil over medium heat. Add the shallot and mushrooms and cook until tender, about 8 minutes. Add the asparagus, Italian seasoning, thyme, crushed red pepper and a dash of salt and black pepper. Cook for an addition 3-4 minutes, stirring frequently. Remove from heat. In a medium bowl, whisk together the eggs, heavy cream and a pinch of salt and black pepper. Stir in the goat's cheese, 1/4 cup of the parmesan cheese and the veggie mixture. Wipe the pan out with a dry paper towel, and then spray generously with a non-stick spray and heat over medium. Pour the egg mixture into the pan, and cook for 8-10 minutes or until the edges are set but the middle is still runny. Slide a rubber spatula around the edge a couple of times during these 8-10 minutes to prevent sticking and to allow the uncooked mixture to flow underneath. Remove from heat and sprinkle on the remaining 1/4 cup of parmesan cheese. Place the frittata under the broiler and broil until set and golden brown, about 3-4 minutes depending on how hot your broiler gets. Remove from heat, garnish with fresh parsley, cut into 8 equal-sized wedges and serve immediately! I like to make a frittata at the beginning of the week and eat for breakfast throughout the week. 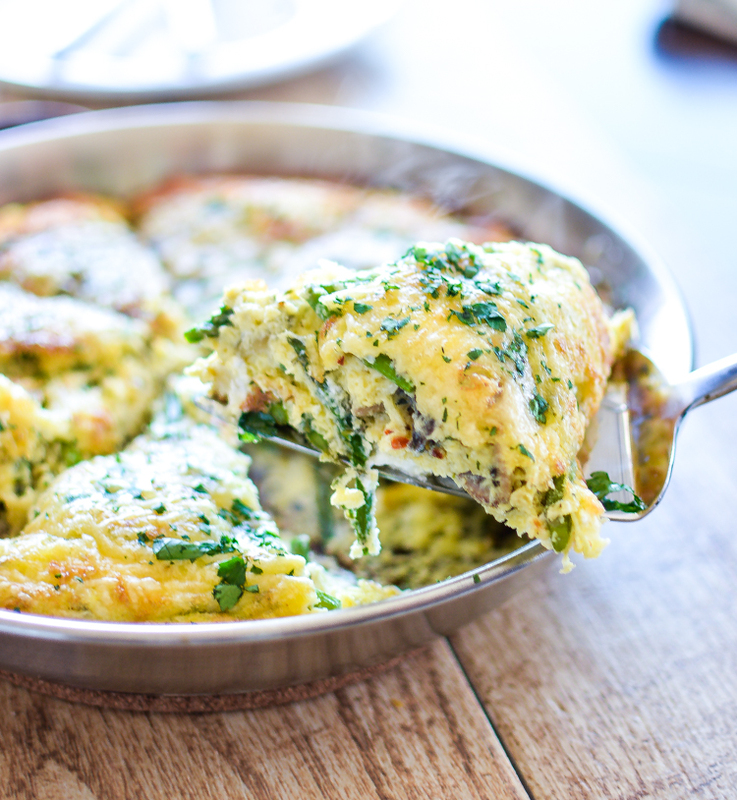 Simply cook the frittata as instructed above and cut into 8 equal-sized pieces. Let it cool completely and then individually wrap each wedge with a piece of foil. When you go to heat it up in the morning, just place the entire parcel in the oven at 400 degrees and cook until warm. That looks amazing Justine! I love any kind of breakfast food, but eggs with mushrooms and asparagus is maybe one of the best! Perfect for Easter! As a sidenote – I made your buttermilk chipotle chicken this weekend and it was fantastic! I LOVE frittatas! I can eat them for breakfast, lunch or dinner. This one is especially tasty looking! I’m super excited for your brunch week! Can we make all of it while I’m over and stuff ourselves silly!? I’m definitely obsessed with breakfast foods, too! This looks like the perfect Easter or spring time meal, Justine! I love the asparagus and mushroom combo. Sounds so delicious! 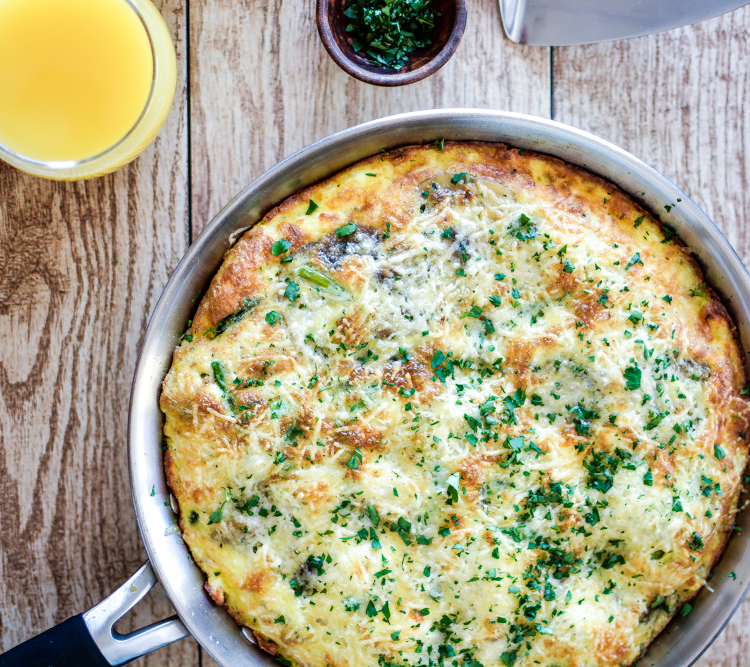 I’ve been using asparagus and mushrooms like crazy lately — this frittata looks wonderful! Pinned. Me too! Thank you so much for the pin, Marcie! Thank you so much, Gayle! I hope you have a wonderful week! I’m with ya! Thank you so much Mira! Yayyyy! I’m so happy you liked the chicken, Stacey! Thanks girl. When I printed this it took 7 sheets. Just wanted the recipe not all the other stuff. you should look into that. I’ll no better next time! bringing this to my attention. I gotta say Justine, that’s one good looking frittata! Way to go! Awe, thank you so much, Jo! Oh, that’s gorgeous! I puffy heart love asparagus AND mushrooms. Pinning to make soon! Thank you so much for the pin, Mary! Sounds so delicious!I love the asparagus and mushroom combo.